See also Category:TOPs for a full list of articles related to TOPs. 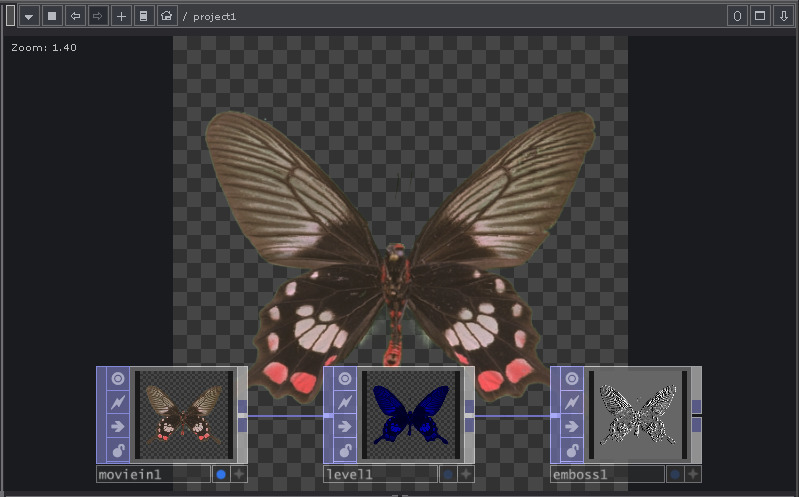 Texture Operators, also known as TOPs, are image operators that provide real-time, GPU-based compositing and image manipulation. All calculations for TOPs are performed on the system's GPU. 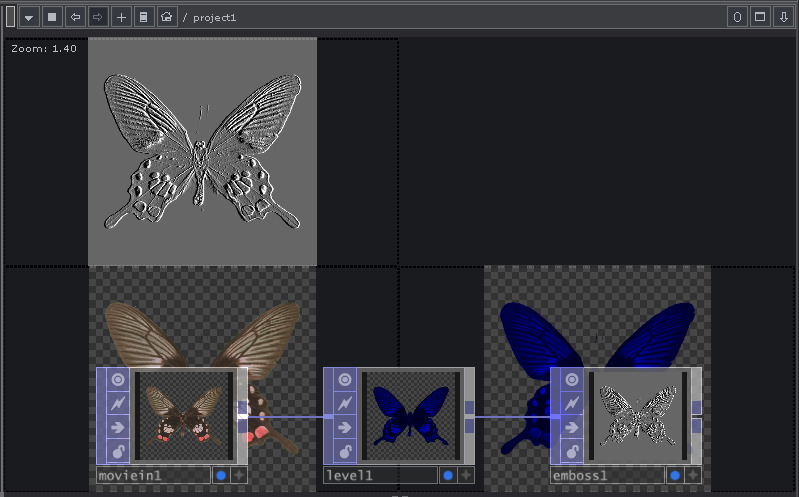 TOPs can be used for preparing textures, compositing streams images and movies, building control panel elements, and almost any other image task you might have. TOPs support many formats, including floating-point image formats for working with high-dynamic range (HDR) images. All renders and composites occur offscreen with TOPs. Data can be scaled to any resolution, limited only by the amount of graphics RAM and the maximum resolution of the graphics card. NOTE: TouchDesigner Non-Commercial is limited to 1280x1280 resolution. The following 16 TOPs are commonly used, we recommend familiarizing yourself with them. Text Text generation with variety of fonts. Composite Combine multiple images with variety of operations like under, difference. Render Render 3D objects, lights and camera into an image. CHOP to Convert CHOP channels into scanlines of an image. All TOPs are documented in the Category:TOPs. The lower right corner contains only 2 flags, the TOP’s Display Flag and Viewer Active Flag. Turning on the display flag displays the TOP as a background in the current Network Pane. Turning on multiple TOP Display Flags will display a tiled sequence of multiple TOP outputs as the background of the network pane. All TOP operators have interactive Node Viewers. To interact with it, turn on the TOP's Viewer Active Flag to make the viewer active. A gray checkerboard background will be displayed in images where an alpha channel is present. This can be turned off by opening Preferences in the Edit menu. In preferences you can choose to use checkerboard or black as you alpha background. Use LMB to move the image around. Use MMB to zoom in and out of the image. Re-center the image by using the home shortcut "h". Clicking the RMB will open the viewer options menu. Keyboard shortcuts are listed beside each entry in the menu. Home - Re-centers and scales the image to fit in the viewer. Display Pixel Values - Displays pixel information over the image. The Timeline should be playing forward for the values to properly update. Display Field Guide - Displays a 24x24 field guide over the image. The guide also displays the action safe zone and title safe zone for the image. Display Mode - The display mode options give the option of viewing certain channels of the image. Color - Display all RGB channles. Red/Green/Blue/Alpha - Display the Red/Green/Blue/Alpha channel respectively. Mono - Display the image in monochrome. This page was last edited on 29 May 2018, at 22:06.